Brompton folding bikes have evolved very slowly, steadily and deliberately over three decades into the most refined bikes of their kind. They don't pursue novelty for its own sake, and most improvements are retrofittable to previous models. While Brompton uses a high number of proprietary parts, these parts or compatible successors tend to be available as service replacements for at least a decade. The last major revisions to Brompton frames occurred in 2004. That's why it's kind of a big deal that there's now a new one: the H-type. H-types resemble the most popular M-type, but the grips are 2.5" higher. Yes that's all, but if you're tall, or just prefer a more upright ride than Bromptons have previously offered, it's huge. The higher stem clamp also means a greater range of fore-aft adjustment than before. 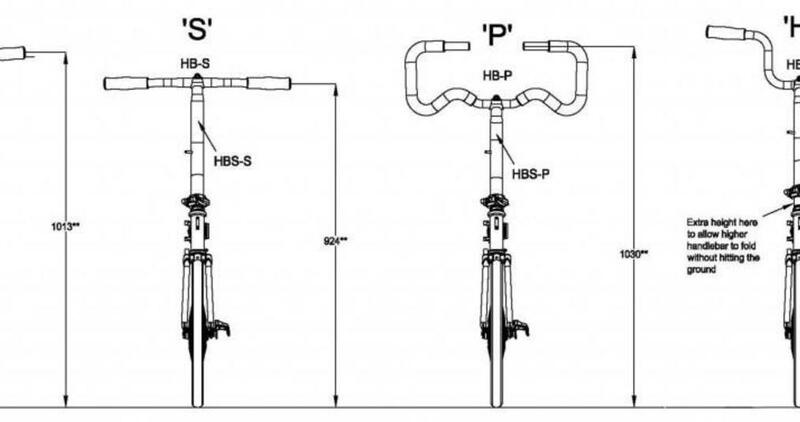 The changed fit possibilities have a bigger effect on handling than you might guess, with a cascade of newly appropriate saddle choices to boot. The folded package is no larger or less tidy than before, naturally. Do you have a Brompton already that you wish were more upright? We can convert it to an H type. We expect to receive 9 H-types this week, nicely equipped. Stop in and give one a go!